The classic magazine now available in a searchable pdf format, All issues from the year 1936. 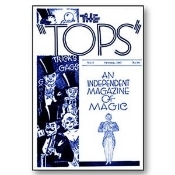 If you enjoy these issues, you can order the complete Tops CD which contains over 20 years of Tops Magazine. Also the New Tops is available both as a download and also on a disk. This is a digital download and you will be allowed 2 downloads (the second is just in case, it is a 36 Meg file) over 2 days.